Bearthday cakes just keep getting more and more creative don't they? This cartoon arrived in my email back in August. I was reminded of it when my friend Woodstock recently posted a rather twisted cartoon. I realize, that I already referenced his cartoon previously, thank-you for your indulgence. I'm not sure which is more disturbing. Hummmmm, maybe in this case it's just a matter of forgiveness? 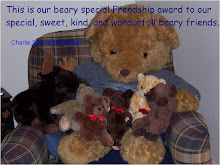 Still busy orientating new bears around here. I'll report more on that front next time. LOL! Cute cartoon Buttons. 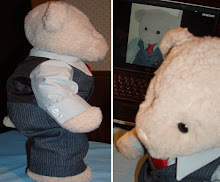 Though rather morose for a Bear to post, don't you think? You've been busy? That was a short post. Good luck orienting all the bears. 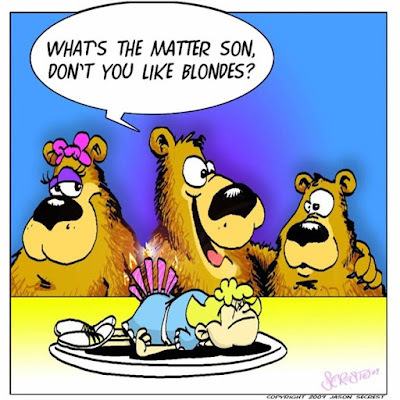 Mother says that is a new take on a 'Blonde' joke, I am just a little worred, but as you say forgiveness is best.